The plot is clear: First the hammer hits the head and then the sickle cuts the throat. Decorated with communist visual identity on the logo side, the Russian Torrent Versions add another level to the immense hype surrounding Ron Morelli’s L.I.E.S. when the label’s shooting stars are engaged in a new series that looks very limited, maybe it even is. Sporting phony cyrillic letters and playing with the stereotypes of Russian internet behavior, two pals from the L.I.E.S.’s Chicago camp like it noisy and dirty. Especially when Beau Wanzer fills the A-side with two bouncing Trax-rooted workouts. Drum machine showdown “Hey Hey Hey Hey” is the real achiever here, followed by more rectangular “Hoedown”. 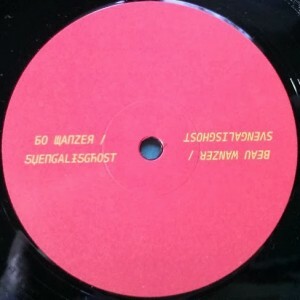 The B-side belongs to the sanguine Svengalisghost who flirts with rocking vocals, first over crude synthetic beats in “The Booth” and secondly over distressed sonic foam in “Dark Mistress”. More Л.А.Й.С. for the people, what else. Endnote: I prefer the written side not the logo side here. It’s the same story as with Dopplereffekt – despite of highly valuing their work I have never really understood the appeal of communist symbols in their visuals.